Occasionally a PureSafety training module will open an additional window in order for you to read an SIUE Policy Statement on the subject you are studying. This is a direct link to a page on SIUE's website, and is not under PureSafety's control. Then close (click the X in the upper right) the new window only. After that, you should see a screen similar to the one below. 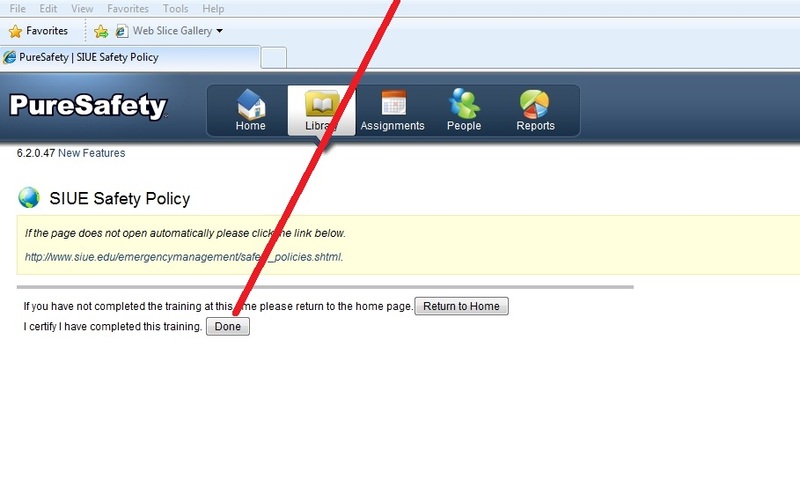 You MUST click the DONE button or you will not get credit for reading the policy, and PureSafety will not allow you to proceed to the next module. Click the DONE button, NOT the Return to Home! If you have any training questions, please email them to lpaul@siue.edu. MINIMUM REQUIREMENTS - Before using the online training, it is recommended that time is first taken to make sure the computer(s) being used meet the minimum requirements. A guideline is listed below. At the login screen, enter your company name, user name and password [listed below] and click Login. To ensure security, you must change your password the first time you log in. Click a training topic name on your list of assignments to begin your training. Be sure to click the Exit Assignment button after Pausing, or completing a training session, to ensure your training is recorded correctly. Printable short instructions to enter and exit training modules are available by clicking this link. Online Help is available by clicking on Help in the upper right while logged in to the training system. After logging into PureSafety, click the Settings button in the upper right-hand corner of the home page. Enter your old password in the box provided. Enter your new password in the box provided. Enter your new password again in the box provided to confirm the spelling. Your password change will take effect immediately.